The rose Sally Holmes was bred in 1976 in the United Kingdom by Robert Holmes, and introduced later that year by Fryer's Roses. Robert Holmes is a rose breeder who is often called an amateur, but it credited with such varieties as the Fairy Snow rose and the Fred Loads rose. It is said that unlike many breeders who strive to introduce several varieties of roses a year, Robert will typically only introduce a single rose of outstanding quality every decade. Sally Holmes roses were created by crossing the Ivory Fashion rose with the Ballerina rose. The result is a cream colored rose that averages about 3.5 inches in diameter and often has ever so subtle pink highlights on the petals. The rose Sally Holmes has a mild fragrance which seems to suit it well and though the blooms tend to form in large clusters of flowers, each bloom will generally have just a few petals, maybe 5 to 8 in all. This rose is a variety that is considered thornless, or near-thornless and can be grown as either a tall bush rose, or a climbing rose. The rose Sally Holmes will typically grow to about 6 to 12 feet tall with a somewhat narrow spread, about half its height. It is a very vigorous grower and is often grown for cut flowers. This rose is highly resistant to many diseases which makes it a favorite among rose growers who prefer low maintenance varieties. This rose is a repeat bloomer and will provide you with multiple flushes over the course of the season. As such you should try to provide it with a location that gets ample sun light. A good rule of thumb for most varieties like Sally Holmes roses is to give them a minimum of 6 to 8 hours each day of direct sun light. It is even preferably if you can give them a spot that get the full morning sun light. This will help dry the dew off the leaves early in the day and reduce the risk even further of diseases like blackspot or mildew. The rose Sally Holmes needs soil that is well drained, and a location that gets good air circulation through your garden. Planting your rose Sally Holmes is real easy and just about anyone can do it. Before you do any digging however, I first recommend that you take a trip to the local garden center and pick up a bag of a good organic compost. When you dig your hole, mix the compost in with the loose soil at a ratio of 2 parts soil to 1 part compost. This stuff makes a really great amendment for most soil types and I've found roses and most other plants absolutely love it! How you plant your Sally Holmes roses depends a lot on how you purchased them. If you picked up one at a local nursery, then more than likely it was already planted in a nursery container and probably ready to bloom. These are the easiest to plant. When planting container plants, I will usually dig a hole that is about twice the diameter of the container it originally came in, and roughly the same depth. This gives you ample room to put a lot of your new soil mix around the root ball, but it also makes sure that your rose Sally Holmes is planted at the same depth it was in the container originally. Now if you bought the rose Sally Holmes online, then they probably shipped it to you as a bareroot plant. These are a little more difficult to plant, but you can handle it. You should first soak the plant overnight in a bucket of lukewarm water to re-hydrate it. Then go ahead and dig yourself a hole that is as wide as the longest roots the plant came with. Make sure the hole is deep enough to allow you to mound up some soil in the center of the hole and set the plant with the bud union about an inch or two below the surface. Once you have your rose Sally Holmes set into place, back fill the hole about halfway to begin with, then take the garden hose and water the soil thoroughly until it flows around the roots like mud. You can then go ahead and back fill the hole the rest of the way and then give it one more heavily watering to settle the loose soil as much as possible. This should ensure that no air pockets have formed around the roots. 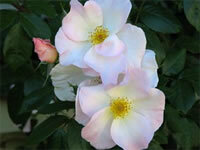 Taking care of the rose Sally Holmes is pretty easy and you can follow normal rose care guidelines for good results. You need to make sure that you give your roses ample water without overwatering them. As a general rule of thumb, one deep watering every week is usually sufficient. However if you live in an unusually dry or hot climate, you may need to step that up to every 4 to 5 days. You can give your Sally Holmes roses a dose of an all-purpose granular fertilizer in the early spring when the leaves start to bud. Since this is a repeat bloomer, it would also benefit from additional feedings throughout the growing season. 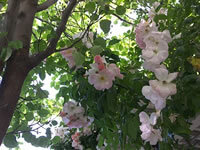 I will usually give a second feeding just before the first big blooms pops, and then a third feeding around the middle of summer to encourage additional late season blooms. 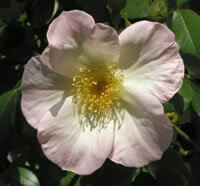 You should prune the rose Sally Holmes in early spring before the leaves start to form. Start off by removing all the dead wood, along with any canes that look overly discolored from disease or whatnot. Next, cut back any lateral canes that overlap one another as these will compete for sun light once the leaves have fully opened. Lastly, if you are growing the rose as a shrub, cut back the remaining canes by roughly one-third of their current height to promote new growth. 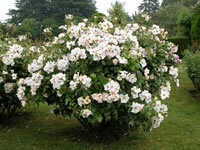 If you are growing this rose as a climber, then just prune it lightly to train and shape it to your desired height. Make sure that you clean up around the base of your rose and throw all the cuttings and debris away in the trash. I always finish up my pruning by giving my roses a fresh layer of mulch.